There are many difficult choices in life: hot dog or hamburger, cat or dog, pen or pencil, Kendall or Kylie (do you see where we’re going with this?) But, while these choices are tough, there is typically one option that we will choose over another. In the world of ever-changing things, some choices are not so simple to make. Lets take the battle of Snapchat vs. Instagram for example. 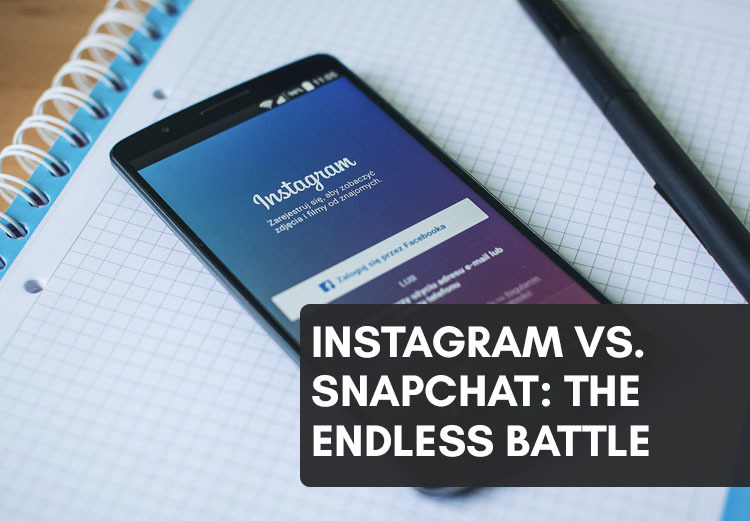 These two opponents have quickly taken over the social scene and have consumers and companies alike asking, “which one is better?” While you may already have your own personal opinion on the matter, we thought we would share our insight as well. In the early years of 2011, Snapchat showed its face to the world for the first time. They introduced the idea of disappearing photos to us, and made us just a little less vulnerable to show people the “behind the scenes” moments of our lives. The app also gives you the option to put a filter over your face and become a dog for the day, you know, if you want a break from the human life. Of course, this took the world by storm, and before we knew it Snapchat had grown into the hub for quick social updates – cue Snapchat stories. It may have started out being the place that millennials would go to see what their friends did the night before, but it has now grown to provide consumers with entertainment, political, and world news. Businesses have begun encompassing the features of both platforms and have been trying to master how to use them to their advantage. This seems like a tough job, but understanding the benefits of using one over the other is important. Take Snapchat for example. The user base is mostly millennial (at a whopping 60% of users under 25), meaning that if you business model speaks mostly to that age demographic, focusing on branding through Snapchat would not be a bad call. Also, the app tends to be used for more “fun” and “unfiltered” content as opposed to pre-planned and designed photos shared in Instagram. In addition, Instagram showcases its “stories” feature based upon who viewers engage with the most on the platform. By showing the stories at the top of the news feed, brands have a higher chance of being viewed by their audience, which is often much larger on Instagram as stories are publically shown by default. So what's the point? Well, while both platforms help to promote your brand, it’s all about where the eyeballs are. As Instagram continues to release new features, people will continue to be drawn to what is new. While these features may mimic Snapchat, users will still be drawn to check out the newest Instagram features – so why not utilize these and let your brand be what they see?